First prize, Second Annual SUSNFS Photo Contest, 2006. T-45 Goshawk at sunset on July 4th. Photograph taken by Flight Surgeon Lieut. Daniel R. Fulk. International Space Station, where Aerospace Medicine specialists have served as astronauts. Archive photo of the National Aeronautics and Space Administration. Residency in Aerospace Medicine prepares physicians for board certification and a rewarding medical career. The practice of Aerospace Medicine focuses on preventive medicine: the study of disease processes in defined communities or population groups and the stimulation of practices with respect to these communities that advance health and prevent disease and injury. Upon completion of the residency, Aerospace Medicine specialists are expected to be team leaders in aerospace and preventive medicine practice. Aerospace Medicine (AM) practice is based on human factors, population management, and risk identification and control in the aviation industry. 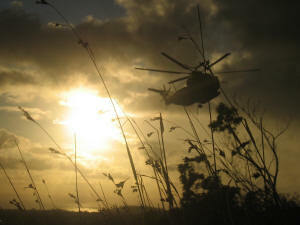 AM specialists guide aeromedical teams and analyze and direct health service support in challenging environments. Military AM specialists become recognized as leaders in operational medicine. There are over forty-eight billets for this specialty in the Navy and the Marine Corps. These include carrier and shore assignments, administration, teaching, preventive medicine and occupational medicine positions. Many billets offer the opportunity to lead other Navy Flight Surgeons, a group renowned for camaraderie with their aviators and contributions to accomplishment of the Navy's missions. There are over fifteen specialty billets in the Army. These include aviation brigade surgeon, regional flight surgeon, academics, research, safety, and physical standards. The brigade flight surgeons supervise over forty-six battalion flight surgeons and find this duty to be extremely satisfying. After military service, civilian opportunities are available in the aerospace industry, preventive medicine, and occupational medicine; public health positions at city, county, state or federal levels; in executive medicine; and in universities and for-profit or volunteer health organizations. For more information, see the web page on the Army and Navy Aerospace Medicine Residency. 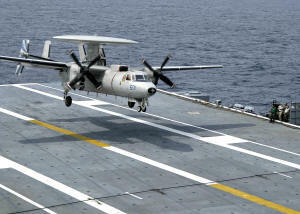 E-2 Hawkeye landing on the deck of aircraft carrier USS Dwight D. Eisenhower (CVN 69). Photograph provided by Flight Surgeon Lt. Cmdr. Walter W. Dalitsch III. Honorable mention, First Annual SUSNFS Photo Contest, 2005. CH-53 Sea Stallion external load ops. Photograph taken by Flight Surgeon Lieut. Peter N. Lombard.